Pyramid Records was founded by British expat Robin Page, in 1972 who was forty and one of the leading lights in the Fluxus arts movement. He had moved from London, England to Cologne, in Germany in 1969 which had been his home ever since. However, Robin Page wasn’t the only expat who was living in Cologne during that period. So was Toby Robinson, a South African, who had travelled from Cape Town, to Germany to work with the legendary Karlheinz Stockhausen, the Godfather of modern German electronic music at the WDR Studio. This was akin to serving an engineering apprenticeship, and would serve Toby Robinson well. When he left Karlheinz Stockhausen’s employ, Toby Robinson went to work at Dierks Studio in Cologne. That was where the future Mad Twiddler would meet Robin Page. By then, Robin Page was a successful and established artist whose work within the Fluxus movement was regarded as groundbreaking, daring and ambitious. One of the trademarks of Robin Page’s work was humour, which he used to challenge what was regarded as good taste within the art establishment. Before long, Robin Page’s painting found an audience, and became particularly sought after. This was what Robin Page had dreamt of, and worked towards ever since ‘he had left’ art college in Vancouver. His new-found success and financial security allowed Robin Page to work towards fulfilling another of his dreams, making music. Robin Page was serious about making music, and had a recording studio in the basement to what looked like to anyone passing by, a derelict building. Deep within its bowels, was Robin Page’s recording studio, and where Pyramid Records first album was recorded. It was then pressed by a Turkish entrepreneur, who just happened to keep his cutting lathe within the same building. Although the lathe was often to used to produce bootlegs,it was able to cut what became PYR 001, Pyramid Records’ first release. It came wrapped in a cover designed by a local student. History had just made with the release of Pyramid Records’ first release. Soon, Robin Page’s nascent label had established a reputation for releasing ambitious and innovative albums. However, Pyramid Records was only in existence until 1976. During that four-year period, Pyramid Records only ever released fifteen albums. These albums were pressed in small quantities. Usually, no more than 50-100 copies of each album was pressed, and this included The Nazgûl’s eponymous debut album which will be released by Mental Experience, an imprint of Guerssen Records, on the ‘2nd’ of February 2018. It’s the first time that The Nazgûl has been released since 1997, just a year after the Pyramid Records’ albums were first “rediscovered.” That was still to come. Nobody can be sure when The Nazgûl entered Robin Page’s basement studio to record what became their eponymous debut album. It may have been 1975, or even as late as 1976. This was just one of several mysteries that surrounded The Nazgûl. One thing that is clear, is where the name The Nazgûl came from. It’s taken from J.R.R. Tolkien’s book Lord Of The Rings. Apart from that, very little is known about The Nazgûl or when they recorded their debut album. Nobody even knows the true identity of the three members of The Nazgûl, who dawned aliases, naming themselves after characters in J.R.R. Tolkien’s book Lord Of The Rings. In The Nazgûl, Frodo was the drummer, percussionist and played gongs, and was joined in the rhythm section by Gandalf, who played bass, Hammond organ, Mini Moog and electric piano. Pippin completed the lineup of The Nazgûl, and played electric guitar, percussion, treated tubular bells and trumpet. Taking charge of production was Toby Robinson, who by then, had dawned the moniker The Mad Twiddler. Joining this colourful cast of characters was Toby Robinson’s brother Mike who it was later claimed had built a piece of equipment that played a part in The Nazgûl’s unique sound. This was what Mike Robinson called the Ghong which comprised four six feet square oven racks that hung from a wooden cross. The Ghong was essentially an instrument that members of The Nazgûl could hit, beat or slap with their hands or anything from kitchen utensils to hammers. Depending on how hard The Ghong was hit, or what it was hit with changed the tonality. While The Ghong was a new “invention” musicians making avant-garde, industrial and Musique concrète had been making new instruments and transforming everyday items into makeshift instruments. Mike Robinson was following in their footsteps, and The Ghong plays an important part in shaping the music on The Nazgûl. The three mystery musicians, made their way into the studio where they were greeted by Toby Robinson who would engineer, record and produce The Nazgûl. Who the musicians were nobody is saying or is willing to say. However, it’s often been speculated that some of the musicians were part of some of the top Krautrock books. Especially a drummer and bassist, who when they weren’t working with their own groups, made their way to the studio to take part in the lengthy jam sessions. There was a problem though, these musicians were part of bands who were signed to major record companies and the terms and conditions of their contract forbade them playing with another group without the express permission of the label. That permission not have been granted, and often, the chance to play on a session came up at the last-minute. By then, it was too much hassle or impossible for the musicians to get in contact with their record company, so they decided to dawn an alias. This appealed to one of the musician’s rebellious and anarchistic streak, and he saw this as a way of beating the system. For The Nazgûl sessions, the band embarked upon four lengthy jams, The Tower Of Barad-Dûr, The Dead Marshes, Shelob’s Lair and Mount Doom. These tracks were later edited by Toby Robinson, and were named after places in J.R.R. Tolkien’s book Lord Of The Ring. It seemed that the main protagonist behind The Nazgûl was a huge admirer of J.R.R. Tolkien’s books. This influenced everything from the name of the band right throughout to the aliases of the musicians and even the names of the tracks on the album. This included The Tower Of Barad-Dûr a thirteen minute epic which opened The Nazgûl. It’s a dark, menacing cinematic track that is rich in imagery, and could easily by part of the soundtrack to a modern-day remake of Lord Of The Rings. Waves of dramatic music unfold as sounds assail the listener and their imagination runs riot. Metallic sound that come courtesy of The Ghong are joined scraping, whining, grinding sounds as the drama continues to build. Meanwhile, a guitar and bass interject as drums pound and roll as avant-garde, industrial and Musique concrète combines with improv as this dramatic soundscape reaches a dramatic crescendo. After that, a calm descends as sustained notes and chords are played on the Hammond organ and a myriad of sound are deployed. They become part of this dark, dramatic and cinematic soundscape that is full imagery and seems to have been inspired by Karlheinz Stockhausen, the Fluxus movement, Eruption and Kluster’s first two albums. Just like the opening track, the introduction to Shelob’s Lair is minimalist, but as it gradually unfolds and the drama builds and the soundscape reveals its secrets. A thunderous irregular bass reverberates, whole a Hammond organ wheezes and a mellotron joins an array of sounds punctuate the soundscape. Together, they create another dark, dramatic and almost menacing soundscape. Especially, as a pulsating bass, otherworldly and flailing sounds combine with what could well be a fire-breathing dragon? All the time, the drama and tension continues builds during this eerie, otherworldly and chilling soundtrack. This genre-melting soundscape is akin to a nightmarish and lysergic Homeric Odyssey that isn’t for those of nervous disposition or the faint hearted . An array of crashing, clanging, ringing and reverberating sound are created by The Ghong while a braying, howling free jazz trumpet plays on The Dead Marshes. Bells ring and join a metal pipe that is transformed into a makeshift instrument. They’re joined by futuristic, sci-fi and bubbling synths that join drums where the tonality and tempo has been changed. Already, elements of abstract, avant-garde, industrial and Musique concrète combine with free jazz even a hint of space rock on an a track where nothing can be taken for granted. An array of disparate and otherworldly, bubbling, watery and flanging sounds are interjected as this innovative and imaginative soundscape takes shape. It’s as if The Nazgûl have decided to: “open the doors of perception” and see what happens? The result was their most ambitious track. Mount Doom closes The Nazgûl and is another cinematic track that is rich in imagery. That is the case from the opening bars to the closing notes. “fire-breathing” dragon returns as water drips within a deep, dangerous and cavernous space. Metallic and digging sounds provide a backdrop to this snarling beast. Adding to the cinematic sound is a futuristic, vocoded vocal that adds an eerie sci-fi sound to a track that is already rich in imagery. It ensures that The Nazgûl closes on high. After 50-100 copies of The Nazgûl were released in 1975 or 1976, nothing was heard of the album until when Toby Robinson approached Virgin Records with some of Pyramid Records’ master tapes. This resulted in the release of Unknown Deutschland-The Krautrock Archive Volume 1 in 1996. Later that year, two further volumes were released. This further fuelled the mythology and speculation that built up around Pyramid Records. Since then, the Pyramid Records’ story has been debated ad infinitum. Sadly, far too many people have become bogged down by the controversy and speculation that surrounds the Pyramid Records’ story. It’s as if they’re determined to disprove that the music was recorded between 1972 and 1976. In doing so, all they’re doing is adding fuel to the fire, and fuelling the debate and speculation. That is a great shame, because for too long, people have become caught up in the Pyramid Records’ mythology. In doing so, they lose sight of the important thing, the music. This includes the fifteen albums Pyramid Records released between 1972 and 1976,and a number of albums that have still to be released some forty years after Pyramid Records closed its doors for the final time. However, Mental Experience an imprint of Guerssen Records have embarked upon a reissue program of the music recorded and released by Pyramid Records.This includes The Nazgûl’s eponymous debut album. 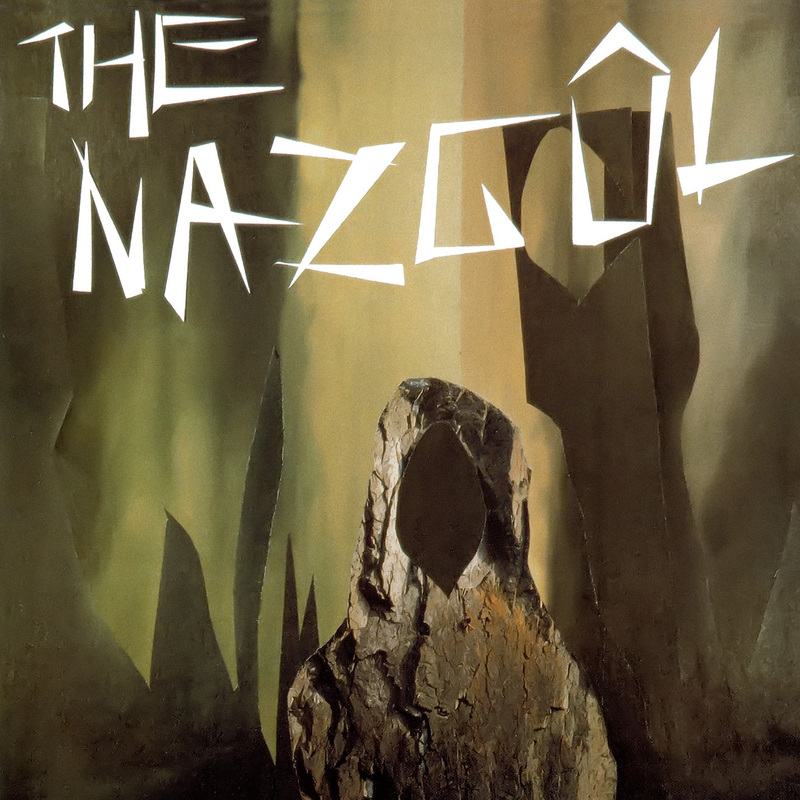 The Nazgûl is an ambitious and innovative genre-melting album that is variously cinematic, dark, dramatic, eerie, futuristic, hypnotic and mesmeric. Other times, an array of sci-fi and otherworldly sounds are added as The Nazgûl take the listener on a captivating and genre-melting journey during this carefully sculpted album. During this journey, The Nazgûl fuse elements of avant-garde, Berlin School, electronica, experimental and Musique concrète with a much purer Kominische avant-garde sound which is similar to the Galactic Explorers’ album Epitaph For Venus. These were the only two albums that Pyramid Records released that much purer Kominische avant-garde sound. This is a move away from the Krautrock that can be heard on the majority of albums Pyramid Records recorded and released. ← PETER BRODERICK-ALL TOGETHER AGAIN. What a story and amazing what people go through to create their music. Like you say, something that far too many people lose track of or need to control in others!